Everyone remembers their first trip to Paris. The perfectly manicured streets, the Haussmannian architecture, the indulgent smell of pâtisseries and freshly baked bread wafting through the air. 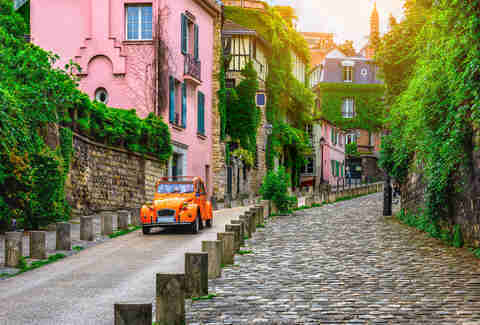 When it comes to romance, Paris has that special je ne sais quoi that captivates millions of visitors day in and day out. And soon, you will be one of them. Where will you stay? What will you do? What will you eat? Are you going to be mocked for wearing New Balances? Maybe. The City of Lights isn’t exactly a walk in the park -- a challenging language and intimidating Parisians can make for an overwhelming experience, especially if this is your first time in Europe. But fear not, intrepid puddle-jumper. Paris is easy to navigate, and half the battle is figuring out how not to piss off the locals. Here’s everything you need to know before you touch down in CDG. The myth that everything in Europe shuts down in August is not a myth at all and totally happens -- especially in countries like Italy, Spain, and you guessed it, France. Most locals leave for vacation this month, and many restaurants and small businesses stay closed for weeks at a time. But truthfully, every month in Paris has its perks -- even August, if avoiding large crowds of Parisians actually sounds appealing to you. 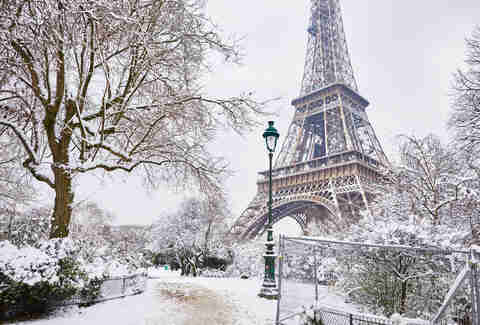 Winters aren’t too cold, and Paris during Christmas time is straight out of a movie. And of course, Paris in the springtime is hard to beat. No, you don’t need to be fluent in French to communicate with Parisians, but knowing the basics will make a huge difference. Download Duolingo and get ready to put on your best French accent. The big four: "bonjour" (hello), "au revoir" (goodbye), "s’il vous plait" (please), and "merci" (thank you). Most of the locals speak pretty good English and are eager to practice. But if you immediately speak English with a French person, they will pretend to not speak English. Speak French with a French person, they will switch into English. It’s just how it works. Say “bonjour” (or “bonsoir” in the evening) and “au revoir” to every shop owner, salesman, and server every time you enter and exit a store or restaurant. All of Paris’ arrondissements (that’s Parisian for “neighborhoods”) offer plenty of hotel and Airbnb options, so it really depends on the type of ambiance you’re looking for. 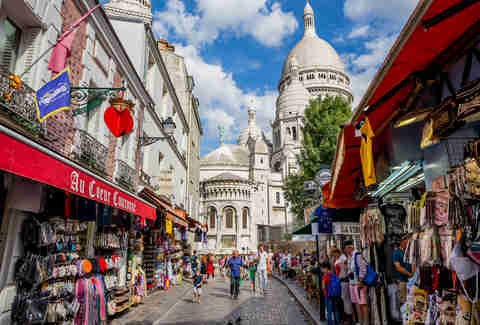 For quaint Parisian charm and high-end shops, look to the Saint-Germain or Marais neighborhood. For something a little more local-feeling and off-the-beaten-path, try the 19th and 20th arrondissements. For an extremely central location, not too far from most tourist attractions, look to the 1st, 2nd, 3rd, or 4th arrondissements. And for that quintessential, artsy Parisian vibe? The hilly 18th, specifically near Montmartre, is just what you’re looking for. Popular opinion will have you believe that all Parisians are beautiful, svelte snobs with perfectly mussed hair and designer clothes. Which is mostly true, but France has loosened up its dress codes considerably in the last 30 years. Plenty of people wear sweatshirts and tank tops. You can too! Keep your voice down if you want to blend in. The French tend to mumble inaudibly. “Faire la bise” instead! An air kiss on each cheek is a standard greeting for both men and women. And eschew the handshake if you’re introduced to someone -- state your name while you faire la bise and you’re all set. It’s actually an excellent system because there’s never any confusion about if you should shake hands, pound, hug, kiss, or high five. People will make it with you. A lot. And hold it an uncomfortably long time. Do it right back. 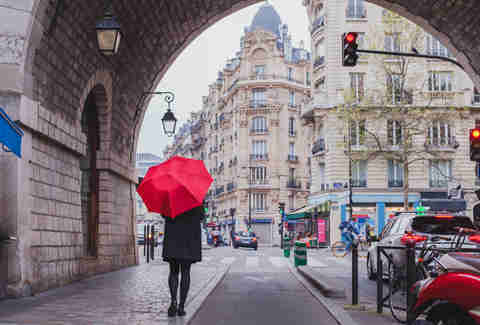 The best way to see Paris is simply by strolling through it. It’s incredibly difficult to get lost -- there are 20 different neighborhoods (arrondissements, remember?) and every single street sign in the entire city denotes which one you’re in. The city’s arrondissements are organized in the shape of a counterclockwise snail; find the 1st arrondissement on a map and count to 20, moving your finger in a counterclockwise, circular motion. The métro system in Paris is super simple and a great way to get around. Over 15 métro lines connect the city underground, linking up with five larger RER lines that head out to surrounding suburbs. Best of all, weekly métro passes will only run you about 22 euros and change. Just be sure to lift the lever on the door if you want to enter or exit -- they don’t open automatically. The system shuts down at 12:40 AM Sunday through Thursday, and 1:40 AM on Fridays and Saturdays. If you get stuck, there are night buses offering public transportation during those late night/early morning hours. Cabs are great, but grabbing one to the airport will run you upwards of 50 bucks. Hopping the RER B will take you straight to CDG for 10 euros -- and if you buy a weekly metro pass, your airport ride is included. (Be aware, hopping the RER to Orly will run you an additional 8 euros, as you must transfer to the ‘Orlyval’ at Antony.) Grab the airport bus from Denfert-Rochereau instead, which is free with your weekly metro pass. Most supermarkets and restaurants accept credit and debit cards, but having a few spare euros in your pocket is always a good idea, especially for those unexpected pit stops to the boulangerie (bakery). For outdoor markets, both produce or antiques, cash will also be a necessary commodity. 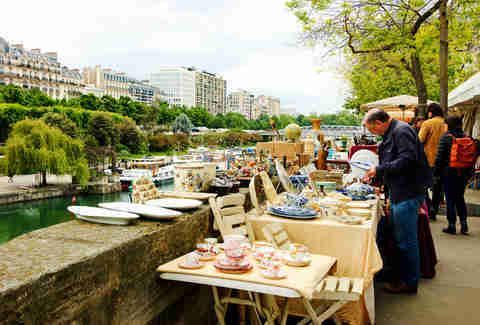 Paris is overflowing with markets! The largest array of outdoor market options will take place Saturdays and Sundays, but smaller produce markets are open seven days a week all over the city. Check out the markets at Bastille, Belleville, Maubert-Mutualité, and Place d’Aligré for excellent weekday options. For picnics, morning runs, and weekend strolls in the park, the Luxembourg Gardens are a staple. But Paris has so many other parks to be discovered! For low-key picnics on the Left Bank, Parc Montsouris is a great choice. For exploring near Belleville, Parc Buttes-Chaumonts is where it’s at. And for quiet reading beside Corinthian pillars? Parc Monceau is your perfect escape. And don’t forget the city’s smaller museums! If you crush on the impressionists, the Musée d’Orsay is as absolute must. The Louvre can be, well, overwhelming, but if you’re dead set on going (I mean, it’s the Louvre!) wear comfortable shoes, see Venus and Mona, and don’t leave without walking through the lavish Napoleon III Apartments. That being said, there are a TON of excellent museums in Paris that should not to be overlooked -- like the contemporary Centre Pompidou, the Cluny Museum for history buffs, and the Musée Rodin for sculptures in a gorgeous garden setting. Will it be crowded? Yes. Will it save you some money? Yes. Should you cram all of your visits into one Sunday? Absolutely not. Prioritize, people! 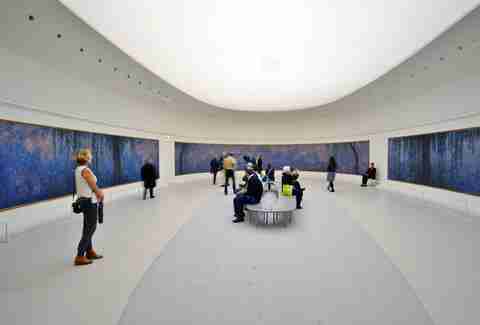 Located in the the southwest corner of the Tuileries Garden, the tiny Musée de l'Orangerie is the permanent home for a handful of works by Picasso, Chaim Soutine, Modigliani, Matisse, and, the pièce de résistance, eight giant panels of Monet’s Water Lilies. It won’t take you more than an hour or two to see everything, so pair the visit with a picnic lunch in the garden. On the subject of seeing art for free, head to Paris’ Marais neighborhood in the 3rd and 4th arrondissement for impeccable displays of Parisian street art. Another great spot is Rue Denoyez in the 19th arrondissement. Louis Vuitton, Valentino, Armani… sure, Paris is home to all of them. But why shell out the big bucks when you could hit one of Paris’ many vintage shops? The Marais is kind of the SoHo of Paris with hip, artsy fashion types and the boutiques to match. It’s also packed with vintage shops, offering up hidden gems for as little as one euro. Definitely take a coffee break and people-watch at an outdoor cafe. Similar to the Empire State Building in NYC, going to the top of the Eiffel Tower is expensive and not necessarily worth the hype. You can see the city from up high from the top of the Tour Montparnasse and actually have the Eiffel Tower in your view, or head to Montmartre for a sweeping, totally free skyline. For a gorgeous, affordable way to see the city (less than 10 euros!) 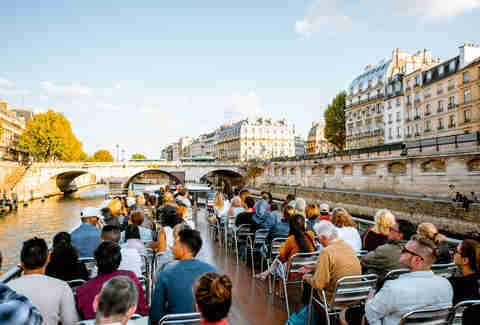 grab a tour on one of the Seine’s many “bateaux mouches” boats. They’re cliche, but truly great. Notre Dame is obviously impressive and worth seeing (from the outside at minimum), as is Sacré-Coeur in Montmartre. But the real sleeper hit is Sainte-Chapelle on the Île de la Cité. The Gothic architecture and stained-glass windows of its interior are stunning, particularly if the sun's out. Which is only from May-September, basically. Not that you won’t have enough to do in Paris, but sometimes, a day trip out of the city is just what the doctor ordered. Visit Versailles, if you have time -- the line to get into the palace is absurdly long, and it’s expensive, but if you’re a history buff knock yourself out. You can also just wander the grounds for free on a sunny day. Accessing France’s many wine regions is as easy as hopping on a high-speed TGV train. Heading to Champagne takes less than an hour (direct train from Gare de l’Est to Reims), and hitting Burgundy or Bordeaux (train to Beaune/Macon or the city of Bordeaux) each take about two hours. If you’re heading to the latter two, we’d recommend staying the night. The French love to drink, though not always at bars and restaurants. That’s right -- drinking in public is fully acceptable, and most people do it, but public intoxication is not tolerated. Don’t be an idiot. 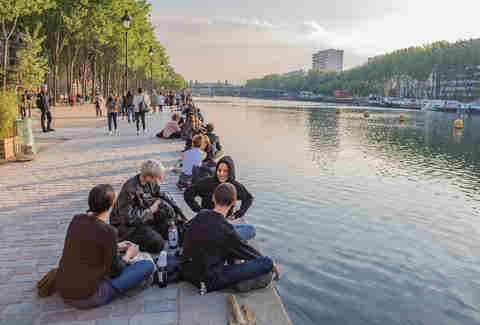 When the weather is warm, locals flock to one of the city’s main bodies of water, apéro supplies in tow (apéro is basically the French version of happy hour). While fancier people and tourists picnic on the banks of the Seine, the place to be for the young and hip is the Canal St. Martin. So buy an inexpensive twist-off top bottle of wine from any Franprix (they sell wine in grocery stores), some peanuts or potato chips, and some fresh veggies (think baby radishes, carrots, or cherry tomatoes) and head to the water for an authentically Parisian happy hour. Paris’ culinary scene is hardly limited to the contents of Mastering the Art of French Cooking. Paris absolutely excels at an array of foreign cuisines, too. For mind-blowingly good Asian food, head to one of the many restaurants on rue de Belleville. For Middle Eastern cuisine, L’as du Falafel is where it’s at. And for pizza? Look no further than Coinstot Vino, Louie Louie, or Tripletta. When it comes to food, the French know what they’re doing. Steak frites, fromage, foie gras, crepes, croissants -- you’d be silly to not try ‘em in their origin country. A few words of advice: look past the touristy neighborhoods when searching for something great to eat (we recommend venturing into the city’s ‘more local’ neighborhoods, such as the 13th, 14th, 10th, and 20th arrondissements). Avoid chain restaurants at all costs -- especially those with menus written in English/multiple languages. And don’t waste your money or calories on cheap crepes in front of the Eiffel Tower -- they’re for tourists and often don't use quality ingredients (you'll see off-brand Nutella in the back, and a stack of pre-made pancakes). Instead, a ham and cheese crepe from a takeaway stand attached to a restaurant is the move. When in doubt, hit the local fromagerie and curate our own cheese plate. Trek down to the Seine, bottle of wine in the other hand, and have the best night of your life. You could brunch, I suppose, but a cafe (one shot of espresso -- make it a “double” for, um, a double) and a pain au chocolat or a croissant is how the French do it. If you want milk in your coffee order “un creme” -- it’s basically a latte. Don’t be a jackass and order “un cafe au lait.” No one does this. In France, leisure is a national pastime. The server will give you plenty of time to look over the menu (just be sure to close it when you’re ready to order, or they will NEVER come). Be prepared to wait a bit between courses. Savor your meal, and feel free to hang out with your coffee when you’ve finished. You’re in France, and the French take their damn time. Unless it’s breakfast, butter likely won’t even be an option. But buttered bread with shellfish is totally okay, for some nonsensical reason. There’s no such thing as a doggie bag in Paris. Most restaurants serve appropriately proportioned dishes that you’re expected to finish. You’ll seem rude otherwise. And unless you’re in Starbucks, don’t ask for a coffee to go. Usually your meal will be “service compris” (tip included). But while tipping is not expected, it’s generally very appreciated. For impeccable service, leave a few euro coins behind -- not only will you give Americans a good reputation, but you’ll probably make your server’s night. Hecklers can be particularly intense in this city. People trying to sell you sunglasses, umbrellas, Eiffel Tower key chains, and water bottles are concentrated around the big tourist spots like Eiffel Tower, Montmartre, and the Louvre and are mostly harmless, if not mad annoying. But if you do decide you want 15 key chains for one euro, don’t be distracted during the transaction as that’s when accomplices pickpocket. More nefarious are the women angling for your sympathy by pretending to be deaf, and the “finger scam,” in which men target non-French speakers and tie a friendship bracelet around your wrist, and then aggressively follow you around demanding payment. They hang out on the steps up to Sacré-Coeur. If you find New Yorkers rude, you’ll likely find Parisians rude, too. Like most city-dwellers, Parisians are stressed and they’re always on the move. French people in general are a passionate bunch -- they’re very straightforward and they love a good argument. A lot of behaviors that might seem rude, like someone cutting you in line, are just part of the everyday culture here. 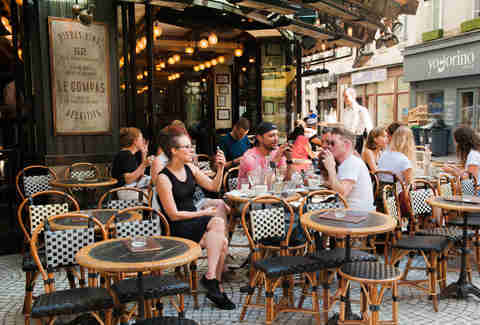 Read up on our guide to French etiquette for more tips on handling the locals. It’s a stereotype for a reason. Could it be the atmospheric rainy weather, the sentimental accordion music, or the glittering Eiffel Tower? Who’s to say -- just prepare yourself for some excessive PDA. Parisians are total romantics, but not to the point of accepting the degredation of their public infrastructure. As of just a few years ago, the city’s famous “Love Lock’” bridge (Pont des Arts) had all of its locks clipped off and replaced with glass placards, to ensure that tourists get the message. Parisians love your love -- just keep it off of their bridges.